Goldwater’s crushing defeat did not stop the victories of Nixon, Reagan and the Bushes. Instead, it led to four decades of the Democratic Party abandoning its New Deal liberalism as it embraced the neoliberal austerity, neoconservative militarism, and environmental stupidities of the Republican right. Lesser evil is a losing strategy. It paves the way for greater evils. When the lesser evil Democrats had the White House under Carter, Clinton, and Obama — with Democratic majorities in both Houses of Congress for at least one session under each of these presidents — it was conservative Republican priorities that the Democrats implemented: increased military spending and foreign interventions; private instead of public health insurance; deregulation of trucking, airlines, media, telecommunications, energy, finance, and other industries; abandonment of promised labor law reforms; repeal of the federal welfare guarantee; deep cuts to federal spending to public housing and other safety net programs; “law-and-order” legislation that spawned mass incarceration; trade bills that strengthened corporate power and pitted workers against each other across national borders. Then came a de facto moratorium on the enforcement of anti-discrimination and desegregation in housing, schools, and employment; the high-stakes testing to justify charter school privatization of public education, inaction on the climate crisis…the list could go on. The point is that for the last 40 years the Democrats have been more successful in getting Republican platform planks through Congress than the Republicans themselves. Hillary Clinton has been at the center of this evolution from New Deal Democrats to corporate New Democrats over the last four decades. • Defeating Trump with another Clinton won’t count for much for the left. What counts most in this election is building a political alternative that can defeat the corporate militarism and environmental inaction shared by both wings of the two-corporate-party political cartel. • Defeating Trump by electing Hillary Clinton won’t defeat the racist scapegoating of minorities that has been the politics of the right from Goldwater, Nixon, and George Wallace to Donald Trump. Clinton’s pro-corporate domestic program has no answers for the downwardly mobile white working and middle classes that are the mass base for Trumpism. The history of Clintonism is “triangulation” — accommodating the right. The Clintons have a long history of dog-whistle racism: the execution of Ricky Ray Rector, the dissing of Sister Souljah at a Rainbow Coalition conference, Hillary’s characterization of Black youth as “super-predators,” Hillary’s 2008 campaign surrogates Bill Clinton, Geraldine Ferraro, Ed Rendel and others messaging that Obama can’t win white votes because he is Black. We can’t rely on Hillary Clinton to fight the right. The best way to defeat the right is with a strong, viable left that can win over the white working-class and middle-class base of Trumpism on the basis of a social and economic program that unites downwardly mobile whites and people of color. There is no time like the present to push a strong and unapologetic left agenda in the electoral arena. A voter revolt is underway in this country and we are beginning to see the outlines of a major political realignment in this election. An unprecedented number of Americans are rejecting both parties and their candidates. The Republican Party appears to be in meltdown as Donald Trump’s erratic campaign continues to falter. Meanwhile, Hillary Clinton is welcoming establishment Republicans fleeing Trump into the Democratic Party through her “Together for America” initiative, moving even farther to the right just weeks after having sabotaged Bernie Sanders’ campaign, as we learned through the leaked DNC emails. Her recent appointment of Ken Salazar — a champion of fracking and the TPP — as transition chief is sending a clear signal to progressive Democrats that their views and their agenda are no longer welcome in the party. These heartbroken progressives who are leaving the Democratic Party in droves after this latest series of betrayals, along with millions of young people and independents who have already rejected the two major parties, are looking for a place to go. There are many ways to advance the struggle for democracy and justice in this election — whether we win the White House or simply win the day by building momentum for the revolutionary change the American people are clamoring for. 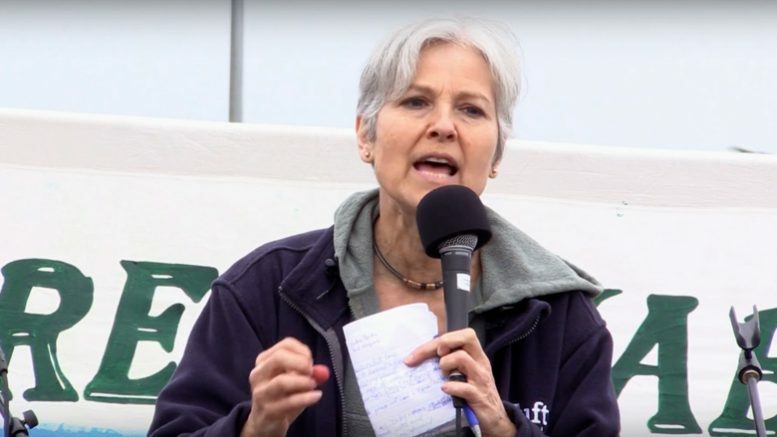 First, the Green presidential campaign plays the traditional role of left third parties in the U.S. of forcing the political system as a whole to take up demands of the people that the major parties have ignored, from the abolition of slavery to old age pensions (Social Security). Our campaign will not let the corporate candidates and media forget such popular demands as improved Medicare for all, an emergency clean energy/climate action program, tuition-free child care, pre-K and public higher education, progressive tax reform, raising the minimum wage to a living wage, public jobs for the unemployed, expanded Social Security benefits, and military spending cuts. We can define the issues that are up for debate. The higher the Stein/Baraka ticket goes in the polls — and the bigger the Stein/Baraka vote on election day — the more political leverage the Greens and the left have in this election and after. Second, ballot line qualification or retention for the Green Party can be won in 37 states for a presidential vote of 1% to 3% in most of these states. The Greens’ goals are not limited to pressuring the two-party duopoly. We want to elect Greens to have the powers of elected office. Greens plan to build that power from below by electing local candidates for municipal, county, state legislative, and US House offices. Winning ballot access in the states through the presidential campaign enables Greens to run and win in local races going forward. Fourth, our presidential campaign is building organization and experience among grassroots Greens. Local campaign committees are identifying supporters and getting them out to vote. This electoral campaign experience and the lists of supporters developed will be used by local Green parties — and campaign committees that become local Green parties after the election — in local elections and issue campaigns starting the day after the presidential election. JS: Our volunteers and donations from Bernie supporters exploded when Sanders endorsed Clinton. We raised nearly $1 million in two weeks after Sanders backed Clinton in mid-July, most of which will be matched by federal presidential primary matching funds. In the streets outside the Democratic National Convention in Philadelphia, the Sanders supporters as a whole — and organized groups like Bernie or Bust, Black Men for Bernie, anti-Clinton delegates for Sanders — were chanting “Jill, Not Hill.” They had me speak at their planned gatherings and impromptu street gatherings. My campaign workers and I didn’t run into one Sanders supporter on the streets who was settling for Clinton. About 100 Bernie supporters we met in Philadelphia made last minute plans and joined us at the Green National Convention the following week in Houston. A number of former Sanders staffers are now on our campaign staff. Former Sanders surrogates Dr. Cornel West and YahNe Ndgo spoke at our Green convention. JS: We have to strengthen our grassroots organization and the financial support of our grassroots supporters. The party is exploring the idea of being a membership party where members are expected to support the party with dues, with waivers for those facing severe financial hardship. And we have to organize those members into local parties that can compete for local elected office as well as participate in social movements and support with real organizational and financial resources their demands for change. The mass membership party is an invention of the left. It is how working people have won gains against the older top-down parties of landed and business elites. Uniquely among the developed democracies of the world, we have yet to form such a mass party in the United States. The Greens don’t take corporate money as the candidates of the Democratic and Republican parties do, which ensures our political independence from the corporate elite. We can beat the organized money of the corporate elite and their political representatives in the Democratic and Republican parties with organized people. That means organizing our supporters into local party branches and expecting the members to support the party with regular small contributions. A central mission of this local organizing must be to build relationships and solidarity across the racial and occupational divisions that divide working people. We are increasingly segregated geographically in our housing and schools. Local Green parties must become a place where we bridge these divides across cities, towns, and metropolitan regions and forge common demands, movements, and campaigns. JS: No matter who wins, even me, the progressive movements must continue to press their demands. We understand that not all the power is up for election. The only power we have to counter these powers that are not up for election — and this is true whether it is Clinton, Trump, or Stein in the presidency — is the popular power of social movements between elections.